The Making of America collection is one of the internet's most frustrating sites...the very opposite of user-friendly. But it's a very good specialty resource for family history work, so you should certainly have a look despite it's shortcomings. And shortcomings there are. The collection is so convoluted that I'm not even sure what to call it (there are many possibilities), or what link to provide (most of them are horribly long and cumbersome). Once you get to the collections (there are several), things aren't much better...it's a slow site, and hard to navigate, search and access results. But the effort is worth it. Through the combined efforts of the University of Michigan and Cornell University, the Making of America site has amassed a large (about a million pages), important and rich collection of Americana, with a strong focus on 19th century US history after the Civil War (antebellum to Reconstruction). These are primary sources -- books and magazines of the period -- and make mention of probably millions of family names, from prominent historical figures to everyday folk. If your ancestors were part of the US in the latter 19th century, you may well find them mentioned here. As for actually using the dang thing, I suggest starting at the University of Michigan Digital Library (UMDL) Collections page. Here you'll find an overview of their collections, including Making of America Books, and MOA Journals. These are both part of a larger collection, known as Nineteenth Century American Publishing which includes works of Abraham Lincoln and Ralph Waldo Emerson, as well a rich collection called The United States and its Territories, 1870 - 1925. There are other important resources tucked away here, the most significant of which is the Digital General Collection (I'm getting tired of making links! ), a very large collection of digitized books which probably overlaps greatly with the MOA books, though the site will never tell you that. This should take you a search page that lists all the UMDL collections, and you can check or uncheck the ones you want included, but don't check them all, as it messes up the system (and ignore the Currently Searching box near the top, which misleadingly and arbitrarily lists a single collection name). If you'd rather access MOA at Cornell, you can do so, along with their other fascinating (but not in a genealogical way) digital collections. As for searching itself, try looking for family names, or the towns that are part of your family history. 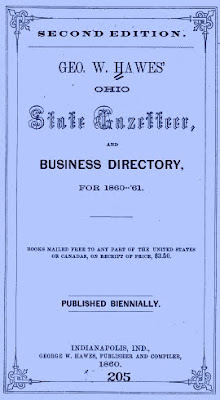 A Bibliographic search for books at MOA with Directory in the title, turns up a host of useful documents, like the Ohio State Gazetteer and Business Directory for 1860-61. See...I told you it was worth it.